Biomass yield and adaptability to a broad range of environments are important characteristics of dedicated energy crops for sustainable bioenergy feedstock production. In addition to yield potential, the role of species diversity on ecosystem services is also growing in importance as we seek to develop sustainable feedstock production systems. 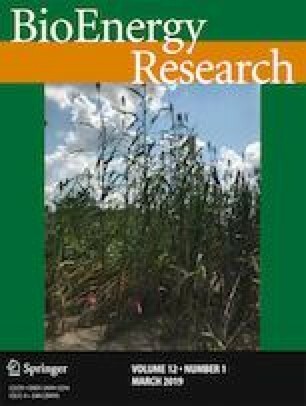 The objective of this study was to compare the biomass yield potential of the commercially available germplasm of native warm-season grasses in monocultures and in blends (mixture of different cultivars of the same species) or mixtures of different species across an environmental gradient (temperature and precipitation) in the Midwest, USA. Warm-season grasses including switchgrass (Panicum virgatum L.), big bluestem (Andropogon gerardii Vitman), indiangrass (Sorghastrum nutans [L.] Nash), sideoats grama (Bouteloua curtipendula [Michx.] Torr.) and Miscanthus × giganteus (Greef and Deu.) were planted in 2009. Biomass was annually harvested from 2010 through 2015 for Urbana, IL and Mead, NE but only in 2010 and 2011 for Ames, IA. The effect of species in monocultures and mixtures (or blends) on biomass yields was significant for all locations. In monocultures, the annual biomass yields averaged over a 6-year period were 11.12 Mg ha−1 and 10.98 Mg ha−1 at Urbana and Mead, respectively, while the annual biomass yield averaged over a 2-year period was 7.99 Mg ha−1 at Ames, IA. Also, the annual biomass yields averaged across the different mixtures and blends at each location were 10.25 Mg ha−1, 9.88 Mg ha−1, and 7.64 Mg ha−1 at Urbana, Mead, and Ames, respectively. At all locations, M. × giganteus and ‘Kanlow N1’ produced the highest biomass yield in monocultures while mixtures containing switchgrass and big bluestem had the greatest mixture yield. The results from this multi-environment study suggest mixtures of different species provided no yield advantage over monocultures for bioenergy feedstocks in Illinois and Nebraska and both systems consistently produced biomass as long as April–July precipitation was near or above the average precipitation (300 mm) of the regions. Moon-Sub Lee and Rob Mitchell contributed equally to this work. The online version of this article ( https://doi.org/10.1007/s12155-018-9947-7) contains supplementary material, which is available to authorized users.